Beyond the New Year, the hometown Strut and the global church's World Day of Peace, as this first day of the civil calendar marks the (albeit non-obligatory this time) Solemnity of Mary, Mother of God, tribute is due. Madre Santa de Dios, Morenita de Tepeyac, mil gracias y más por tu regalo de una vida nueva -- una renovación, una nueva esperanza y la oportunidad de redención -- para la fe en este país. Lest anyone remains quizzical about the lingual switch-up of recent weeks, the figures best speak for themselves: as of this writing, a majority of US Catholics aged 18-29 -- that is, this scribe's generation -- self-identify as Latino/a, as do nearly 40% of the national pewfolk between ages 30-50. As these two youngest poll-able generations comprise the demographic lion's share of the nation's roughly 68 million faithful (nearly three-fifths of us, to be precise), the most seismic shift the makeup of this Stateside church has experienced in nearly two centuries has already come to pass in our midst -- a wildly altered reality that doesn't even take into account the birth rates which only serve to punctuate and swell the sea-change all the more. As ever under the mantle of the Mother of God, welcome to a new decade, church -- yet even more, welcome to a new era of the faith's five-century journey in this place: not so much an age of something "new," but simply American Catholicism's return en masse to the culture and spirit of its first founders. 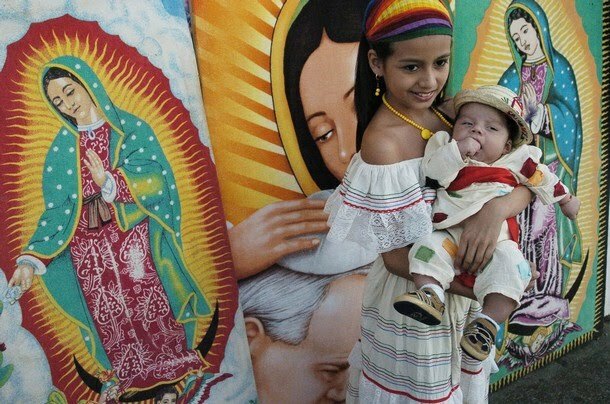 Whatever title of hers you prefer, que viva la Virgen -- and again, to one and all, a joyous, Blessed and Happy New Year.